A view of the COSMOS field in the constellation of Sextans, seen in infrared light. This corresponds closely to the region of the sky studied in the new research. | ESO/UltraVISTA team. Astronomers from Lancaster University have modeled conditions during the earliest moments of the cosmos. Astronomers have looked back in time to create one of the largest 3D models of the early universe. 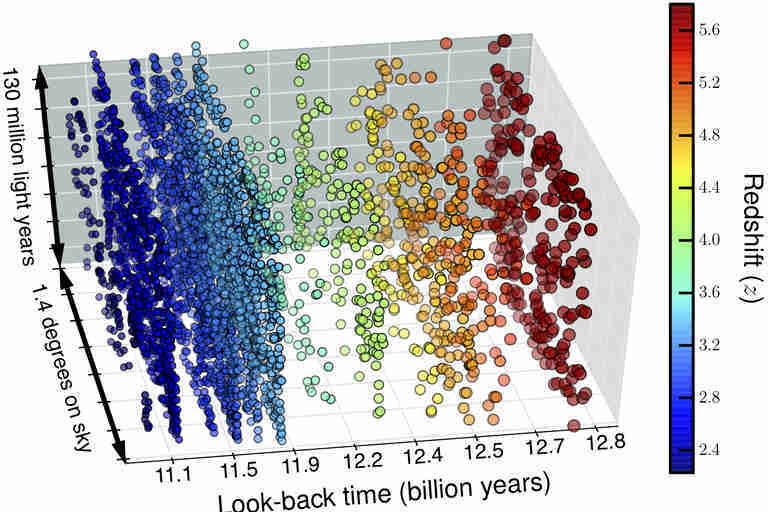 Using the data from the Subaru Telescope in Hawaii and the Isaac Newton Telescope in the Canary Islands, the scientists were able to look at 16 different epochs between 11 and 13 billion years ago. The maps they created show what conditions were like during the earliest moments of the cosmos, when the universe was only 7 to 20 percent its current age. The researchers from Lancaster University discovered nearly 4,000 early galaxies, many of which likely evolved into ones much like our own Milky Way. But billions of years ago, these galaxies were much smaller and more compact. “The bulk of the distant galaxies we found are only about 3,000 light-years across in size, while our Milky Way is about 30 times larger,” Ana Paulino-Afonso, a Ph.d. student at the university, said in a statement. “Their compactness likely explains many of their exciting physical properties that were common in the early universe." It is extremely difficult to study these small, faint sources of light from the early universe. Thirteen billion years ago, the universe was opaque and filled with neutral hydrogen gas that blocked much of the light emitted from early galaxies. But then came the Epoch of Reionisation, when most of the neutral hydrogen was ionized by the increasing radiation from the first, massive stars, which then allowed light to travel freely through the cosmos. The team's findings appear in two papers in the journal Monthly Notices of the Royal Astronomical Society. The research team, led by David Sobral, used special filters to look for a particular wavelength of light called Lyman alpha radiation. Galaxies that emits radiation are extremely distant. And because of the finite travel time of light, they provide glimpses into the history of the universe. They are thought to be the progenitors of most modern Milky Way-type galaxies. 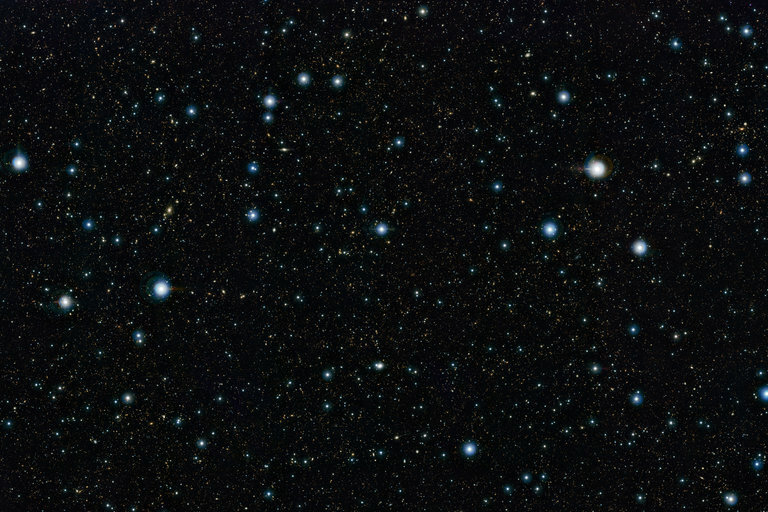 To find these galaxies, the researchers used 16 different narrow and medium band filters and looked at one of the most widely studied regions of sky outside our Milky Way. This area of the universe has been the focus of the Cosmic Evolution Survey (COSMOS), which probes for signs of galaxy formation and evolution as a function of cosmic time and the local galaxy environment. The field is a small, 2 degree area of the sky located in the direction of the constellation of Sextans. “We used large amounts of data taken with 16 special filters on wide field cameras and processed them here in Lancaster to literally slice the universe in cosmic time and time-travel to the distant past with 16 well-defined, cosmic-time destinations," said Sergio Santos, another Lancaster University Ph.d. student and team member. Researchers are able to date the light from the galaxies because it is stretched by the expansion of the universe, which increases its wavelength, pulling toward the red end of the visible-light spectrum. By measuring the redshift of a galaxy, astronomers can figure out its distance and how long its light has taken to reach us, which tells them how far back they’re peering in time. The researchers found that star formation evolves by fits and starts. "These early galaxies seem to have gone through many more ‘bursts’ when they formed stars, instead of forming them at a relatively steady rate like our own galaxy,” Sobral said in a statement. “Additionally, they seem to have a population of young stars that is hotter, bluer, and more metal-poor than those we see today." Sobral has been studying the early universe for much of his career. In 2015, he led a team that found the first example of a spectacularly bright galaxy within the Epoch of Reionization, which was thought to be home to first generation stars, and a year later, he found similar galaxies made up of the earliest stars.